Phew! I’m back from vacation! I was actually back on Monday, arthritis but have been so busy working and running around that I’ve neglected the blog, which is very very bad of me. But here I am, and so ready to start cooking. I ate so well on my trip! We had farm-fresh salad, pork loin, blue cheese and tons of wine in Napa. Delicious chorizo and polenta mussels in Portland, which I am dying to recreate. Fried chicken on biscuits with honey, mustard and pickles (awesome!). Chilled fennel soup with dungeness crab, avocado and grapefruit in Vancouver. Oh! and Japanese-style hot dogs with terriyaki, kewpie mayonnaise and toasted nori (best hot dog ever!). And so many micro-brewed beers and local wines! I can’t wait to re-create all of those flavors. But for now, I’ve got 2 recipes to post. (I’m trying to make up for being such a slacker.) 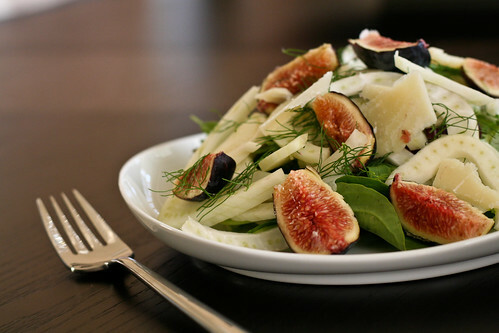 The first is a pretty fig and fennel salad with shaved pecorino cheese and a lemony dressing. It’s a light and easy meal perfect for summer and fancy enough to serve guests. But you have to make it now before figs go out of season! The second is a 10-minute honey mustard chicken. It’s honestly as simple as five ingredients and a hot pan. 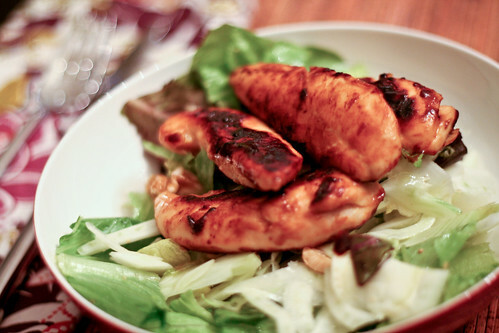 The result is a sweet and tangy chicken perfect for a side of potatoes or on top of a salad. So easy and I bet you have the ingredients in your fridge right now. This weekend, I’ll be making some new things inspired by my Pacific Northwest trip. I’m hoping they come out well enough to post some fun new recipes. This salad would be fantastic with a few slices of prosciutto draped over it. Unfortunately, I didn’t have any, but will definitely make sure I do next time I make this. When you’re just about ready to eat, place the greens and fennel in a large bowl and drizzle with the lemon juice and olive oil, and sprinkle with salt. Toss well. Plate the greens & fennel, top with the cheese, then the figs, then the prosciutto. Serve immediately. I actually served this over the fennel salad above (minus the figs) and it tasted great together. This chicken would be great for sandwiches, wraps, pita filling, salads and pretty much any side you usually make on a weeknight. Heat a large, heavy skillet over medium-high heat and add the oil. While it heats, whisk the mustard, honey and shoyu together in a bowl. Add the chicken and mix until the chicken is evenly coated. Add the chicken to the pan, pouring any extra sauce over it. Cook for 5 minutes on each side until sauce forms a nice, brown char and the chicken is cooked through. Serve with the side of your pleasing. Fennel is one of my all time favorite things and I’ve been dying to use figs for something as of late! Check, check and double check! I’m headed up Napa way soon, love it there and would love to know where you found fantastic food. Hi Erinn – I love fennel too! And figs! In Napa, we went to Ad Hoc – Thomas Keller’s set menu, prix fixe restaurant. I loved the atmosphere and the food was spectacular! This looks so good! I recently did a fennel and avocado salad, but looks like I’ll have to buy some figs soon! Melissa – Gorgeous photos and recipes just how I like them – simple. I especially like how you captured those figs. I just so happened to have a fennel bulb and two over ripe figs (desperate to be eaten) – I sort of adapted it to fit what else I could find lurking in my fridge – and it was delicious!!! I used Manchenga cheese – its a spanish version of hard cheeses like pecorino. – my local Sainsbury’s supermarket stocks it. For the greens I used Pea shoots (again good old supermarket) no fresh lemmon so I had to improvise – I always keep a jiff lemmon for such emergancies – so I had to disguise that with some garlic & chillie salad dressing I made last week… thank you for your inspiration… my first visit to your blog – but its now bookmarked!! Have you tried fennel with fresh orange segments – thats nice too! In leading lawyers’ long run fights, Strine said, When i don’t feel there were perfect overview about also facet belonging to the potential blend, issue associated with first favorable tells you two years ago.